It is extremely rare that Pakistan plays a test series and comes out of it with its batsmen breaking record after record. The Pakistani batsmen have played so well in this series against Australia and have broken so many records that one wonders what woke up these sleeping giants. I believe that in this series we have seen the best ever performance by Pakistani batsmen ever in a test series. At least in my lifetime. And I am not buying any excuses regarding flat pitches because it is the same pitches where the Australian batsmen have fallen like nine pins. Besides a David Warner century in the first test and a Mitchell Marsh 87 in the second, the Aussies have had no answer to Pakistan's pace, reverse swing, and spin. So many records have tumbled in this series, that its become hard to keep a tab on all of them. If you take a look at the best betting apps out there, each one of them will tell you that the Pakistanis achieved all this against the odds! Here is what the Pakistani batsmen have achieved in the two tests against Australia. The record was held by Inzamam Ul Haq with 25 centuries. Younis Khan started this test series with 24 hundreds, equal with Yousuf and one behind Inzamam, and he ended the test series with 27 centuries, an all time Pakistan record. Glen Turner scored 101 and 110* in the same test against Australia in 1974. Since then, Australia played 425 tests over 40 years and no one ever achieved the feat of twin centuries against them. The Australians were known to roll over opposition batsmen, and if any one scored big against them, he wouldn't a second time around because the Aussie bowlers were well prepared for him. This test series witnessed three Pakistani batsmen score centuries in both innings of a test! Younis Khan did it in the first test with 106 and 103*, while Azhar Ali (109 & 100*) and Misbah Ul Haq (101 & 101*) did it in the second test. Something that was not managed over 40 years and 425 tests was achieved by 3 Pakistanis in just 10 days and 2 tests! It was in December 1924 - January 1925 when Herbert Sutcliffe scored 115, 176, and 127 in three consecutive innings against Australia. No one managed that feat for another 90 years till the Australians came up against Younis Khan in the UAE. With scores of 106, 103*, and 213 Younis Khan became only the second batsman to score three consecutive centuries against Australia in tests. You can look at that another way - Younis Khan is the only batsman in the world to score 2 centuries and 1 double century in 3 consecutive test innings against Australia. Additionally, Younis Khan's 422 runs in 3 consecutive innings is the highest aggregate for any batsman against Australia in 3 consecutive test innings, beating Sutcliffe's 418 scored 90 years ago. Sachin Tendulkar scored 403 runs in 4 innings in India's 2-test series against Australia in 2010-11. That was the highest aggregate in a 2-test series against Australia. Younis Khan aggregated 468 runs in his 4 innings in this series against Australia, taking the record away from Sachin Tendulkar. Just for the record, the highest aggregate in a 3-test series against Australia is also held by a Pakistani - Salim Malik, who scored 557 runs in 6 innings in the series in 1994-95. Interestingly that was the last time Pakistan beat Australia in a test series. Javed Miandad held the record for the highest aggregate by a Pakistani batsman in a 2-test series. He had scored 389 runs in only 2 innings, including a cracking 271, against New Zealand in 1988-89. Younis Khan now holds that record with his record run spree against Australia. Jacques Kallis held the world record with a fifty off only 24 deliveries against Zimbabwe in 2004-05. The Pakistani record was held by Shahid Afridi who had managed it in 26 deliveries against India, also in 2004-05. Misbah broke the world and Pakistani records by getting his fifty off only 21 deliveries against Australia in the second test of the series. Sir Vivian Richards was the owner of the record for the fastest 100 in test matches. He had reached his 100 off only 56 deliveries against England in the summer of 1986. For 28 years he was the sole owner of the record. However, now, Sir Viv shares the record with Misbah who smashed a 100 off 56 deliveries against Australia in the second test of the series. Sir Viv's innings was 110* off 58 deliveries with 7 sixes and 7 fours. Misbah's was 101* off 57 deliveries with 5 sixes and 11 fours. Prior to this series between Pakistan and Australia, there were 11 batsmen who had scored centuries against all the other 9 test playing nations, but none of them were from Pakistan. Younis Khan became the first batsman from Pakistan to join that esteemed club of centurions. Inzamam Ul Haq, with 2,707 runs, was Pakistan's highest scorer in test wins away from home before Pakistan started this series against Australia. After the first test that Pakistan won, Younis Khan went past Inzamam's tally and is now Pakistan's leading run scorer in test wins away from home with 2,847 runs. If Pakistan wins the second test against Australia, which looks likely by tomorrow, Younis Khan will extend that runs tally to 3,106. 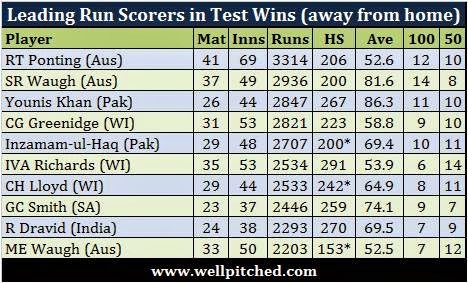 That will leave only Ricky Ponting ahead of him in the list of highest run scorers in test wins away from home. Sir Don Bradman and Herbert Sutcliffe were the only batsmen in the world who boasted an average of 50 or more in each of the 4 innings of a test match (with a minimum of 10 knocks in each innings). With his exploits in this series against Australia, Younis Khan now ranks alongside the two greats and averages over 50 in each of the 4 innings of tests. This feat was achieved only once before when Ian Chappell and Greg Chappell, both scored centuries in both innings of the test between Australia and New Zealand in 1974. Today, Misbah Ul Haq and Azhar Ali joined them and became the second pair of batsmen in the world to score centuries in both innings of the same test. I'm sure there are a few more records that I missed out on, but these are 11 grandiose facts regarding batsmen from a team that is not known for its batting. It is a team that has historically perished in font of quality bowling and a team that has often collapsed for no good reason. Yet, here they are, scoring heaps of runs against the world's number 2 test team and arguably the best bowling attack in the world. Another interesting fact is that five Pakistani batsmen, Younis Khan, Misbah Ul Haq, Azhar Ali, Ahmed Shehzad, and Sarfaraz Ahmed, scored 9 centuries against Australia in the two tests. All of them scored their first ever test century against Australia in this series. Those are some amazing achievements by Pakistani batsmen. They look even greater when one hears the names of batsmen whose records were broken or equalled by these Pakistani batsmen. Sir Don Bradman, Herbert Sutcliffe, Ian Chappell, Greg Chappell, Glen Turner, Sir Viv Richards, Javed Miandad, Inzamam Ul Haq, Sachin Tendulkar, Jacques Kallis, Mohammad Yousuf, Steve Waugh, Brian Lara, Kumar Sangakkara, Ricky Ponting, and Rahul Dravid were all bettered or equalled by the Pakistani batsmen during the course of this test series against Australia! Nobody in the history of test cricket has thrashed Australia so majestically! At such a high average with pure disdain.....Pure, unadulterated, and better-than-an-drug high. Never thought I ll feel this happy ever in my life again about test cricket but Misbah and YK are absolute legends! !